The Image Comics/Skybound series THIEF OF THIEVES, Robert Kirkman’s cinematic crime comic has no zombies, no superheroes, and no larger-than-life arsenal - and it has become one of the best-selling independent comics hits of the year. The first three issues are now entering their fourth printings, with the fourth issue not far behind with a third printing. 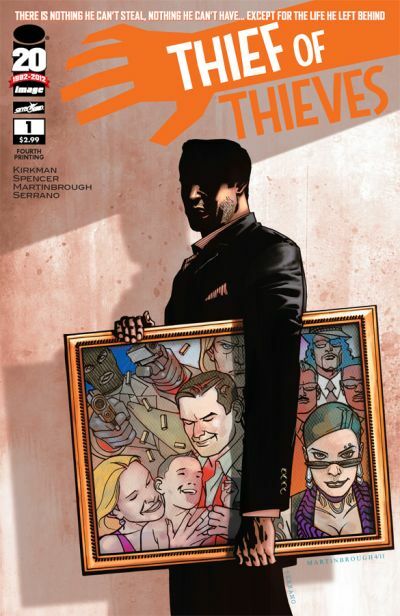 With a story overseen by Kirkman (THE WALKING DEAD, INVINCIBLE), scripts by Nick Spencer (MORNING GLORIES) and art by Shawn Martinbrough, THIEF OF THIEVES is the story of a master thief, “Redmond,” who tries to leave a life of crime to reclaim his “real” life and family as Conrad Paulson. Or is it his real life? An estranged wife, a son set on following in his footsteps - Paulson is finding that identities can’t be changed as easily as suits. The third printing of THIEF OF THIEVES #1 will be in stores this week, on May 16, and the third printings of #2 and #3 and the second printing of #4 will be in stores the following week, on May 23. The most current printings will land on shelves on June 13 and can be pre-ordered from comic book stores now. THIEF OF THIEVES is an ongoing series, and issue #5 will be stores on June 6. Previews of each new THIEF OF THIEVES, which is published by Image Comics under Kirkman’s Skybound imprint, appear on The Hollywood Reporter website exclusively on the Friday before its release. It is available in comic book stores and digitally from multiple platforms. AMC has optioned the title as a series with Kirkman and Chic Eglee (Dexter) serving as Creators/Executive Producers/Writers.